Richard's first vinyl EP in 30 years! 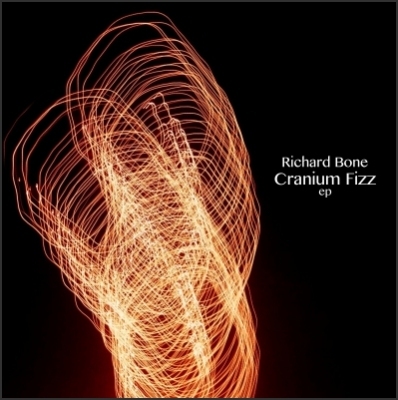 "The Cranium Fizz EP marks Richard Bone's first return to the vinyl format in 30 years! His last LP was the critically acclaimed album, Exspectacle on the UK's Survival Records label in 1983. Over 25 CDs and many stylistic changes have taken place since then. Long gone are the layered vocals with their intricate arrangements. The intervening years have seen Richard Bone experiment with ambient permutations of electronica, lounge, jazz and even bossa nova. Now, elements of many of those styles re-emerge on the upbeat and elegant Cranium Fizz EP. 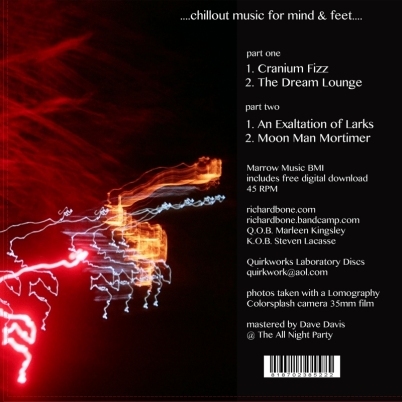 The music is described as chillout music for mind and feet. The title track is the most danceable of the four tracks with elements of electronica and jazz sprinkled throughout. Highly rhythmic it is, but it never descends into a tacky homage to disco. Far from it. Bleeps and cranium fizzes are sprinkled atop an electric piano. The piano in turn rocks firmly over solid bass and percussion. The other 3 tracks slow the pace down a bit as they draw the mind into the chillout grooves. The production is clever and, as with all Richard Bone releases, begs to be heard on headphones!" written by Michael Foster of Ambient Visions!